High street brands seem to be dropping like flies. But it’s not for want of trying. The average expenditure rates of consumers are actually on the rise, but UK high streets still find themselves in a deep and seemingly unending slump. Market trends and consumer research indicate that buying patterns are changing, exposing the volatility and vulnerability of the high street, which in turn applies more pressure on already faltering businesses. So what went wrong for HMV, Patisserie Valerie, House of Fraser and everyone else? It’s often dismissed as the result of recent market trends and the growth of online retailers. After all, the Office of National Statistics did recently reveal that British people spend more online than the Chinese, Japanese and Russians. But is that all there is to it? Can we blame the death of the high street solely on the birth of Ecommerce? Or do successful online businesses operate in a different way and can we learn something from their experience? 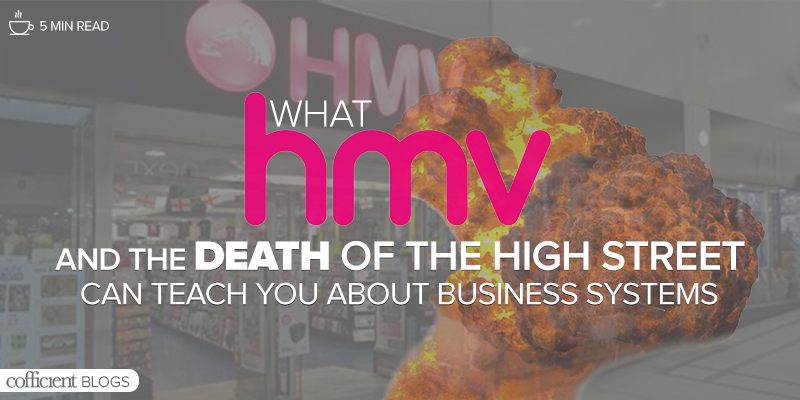 While businesses like HMV may have just survived after hanging on for dear life, many more disappear each year. In this blog, we will take you through just a few reasons why a good business system can be the difference between expansion, stagnation and administration. Most importantly, we hope to show how a solid foundation can prevent your business from becoming obsolete. High street shopping is in the midst of an enormous crisis but dismissing it as an unavoidable situation may be somewhat naïve. Most online businesses and software companies can’t function without integrative systems that link up the back and front offices. That’s why many of them have been so quick to adopt sophisticated business systems, like NetSuite and SAP Business ByDesign. Early adopters include, as you would expect, software providers, app developers, and tech companies, all of which now tend to move their operations to cloud applications that can handle their vast data volumes and complicated workflows. This raises some interesting questions: does their digital presence require them to iron out operational inefficiencies at a higher rate than high street stores? Other, more traditional industries, like manufacturing, have lagged behind, lost in often archaic methods and processes that are both time consuming and inefficient. While you could argue that their decline is due to market trends, it could also be the result of poor planning and weak systems. However, in recent years some manufacturing businesses have made the digital transition and are reaping the benefits. Many of these failing businesses share one key trait: a fundamental inability to adapt. Integrated business systems like NetSuite offer you the insight and functionality you need to react to any extenuating circumstances, without limitation. The result is a cognitive system that identifies and pre-empts issues before they arise, allowing you to use your historical and current data to make the best possible decisions for the future. The commercial landscape is changing, and it’s changing fast. And while every business is dependent on its market climate, there are undoubtedly factors that can act as safeguards in times of economic uncertainty. Elements like automation aren’t just a feature of business growth; they have become a prerequisite. Future-proofing your systems and processes protects the longevity of your entire business. And it’s not just a superficial time-saving mechanism. It’s a serious asset and it will allow your business to evolve whenever necessary. These days, success is built on more than just a fancy shopfront – you need the systems to go with it. At the end of the day, it can make or break your business. This is becoming more and more apparent, especially as new scandals and faulty financial reporting expose the fragility of certain business systems. For example, could the Patisserie Valerie fraud have been detected sooner or was the enduring nature of the fraud exacerbated by the conditions and systems that allowed it to happen in the first place? It may be too early to speculate, but it does underpin the importance of intelligent systems that can eradicate human error and flag important issues. Netflix is a good example of how important flexibility and adaptability is. Launched in 1997, it was initially the world’s first online DVD rental store, sending out DVD’s to their subscribers. They were completely reliant on US postal services and knew, despite initial profits, that something had to change. The invention of YouTube and other streaming services changed everything for the company. When DVD sales plummeted between 2006 and 2011, they already knew what their next step was. Now, Netflix is an almost omnipresent force in modern society, but most people don’t even know the extent to which they’ve had to adapt their business and systems. Admirably, they did it without the use of sophisticated business systems, but for every Netflix success story, there are thousands of failures. Don’t become a victim of your own inefficiency. Let your business systems do the hard work for you. Contact Cofficient if you want to discuss what system could work for your business. We’ll happily put together a custom solution that could form the basis of your future business growth.